She doesn’t know how much it weighs. Nobody she knows or has ever met could tell you how much their bike weighs. Likewise, she doesn’t know how far she rides each day. It isn’t interesting. She rides at a good pace, not too fast to cause a sweat, and the ride is nice enough. She likes the fresh air and she often sees friends on the bike lanes. She loves crossing The Lakes and seeing the transformation from season to season. That will suffice. She doesn’t wake up and make a decision to “commute by bike to work today”. It’s just a part of her day. She just walks out of her flat and gets on her bike. If it has a puncture, she’ll walk it down to the local bike shop to get it repaired and then take the bus or train to work. Picking it up in the afternoon. She isn’t an activist, doesn’t belong to a cycling organisation with a long acronym and she doesn’t even think about the fact that she lives in something called a “bike culture”. 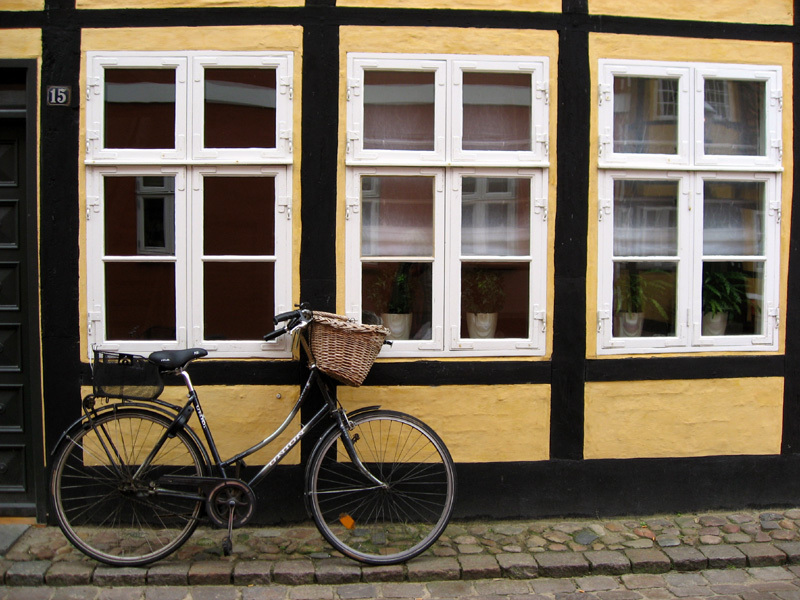 From a great article on Danish biking by Copenhagen Cycle Chic. This site has become one of my daily reads. This looks almost like my bike! Which reminds me that I must get my husband to ship it to me as I noticed too late that the movers had forgotten to take it. This article could have been written about Germany, too, it is a lifestyle I miss dearly (as does my overweight body!) At least I now live in a place where I see more people walking and cycling than I ever did in my previous home town. I spoke to a woman living in Amsterdam when I was there in July and she said she didn’t have a bike. We were all aghast, given the huge amounts of bikes. Then she finished her sentence “I’ve had 13 bikes in the last 2 years and all of them have been stolen”. Bikes are wonderful for where most of the landscape is flat, but I live in a very hilly place indeed and if I rode my bike everywhere I would need a shower every time I arrived at a different place! Pingback: Hygge House » Blog Archive » Gear Shmear.